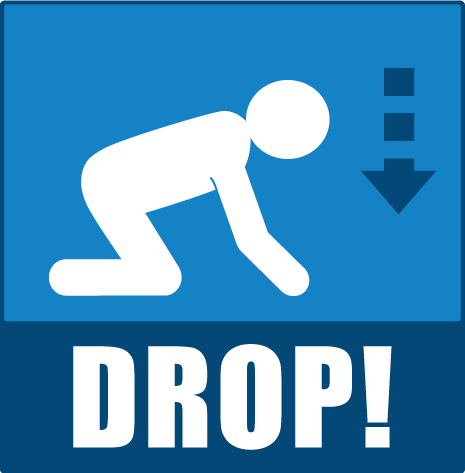 Federal, state, and local emergency management experts and other official preparedness organizations all agree that "Drop, Cover, and Hold On" is the appropriate action to reduce injury and death during earthquakes (learn why here). 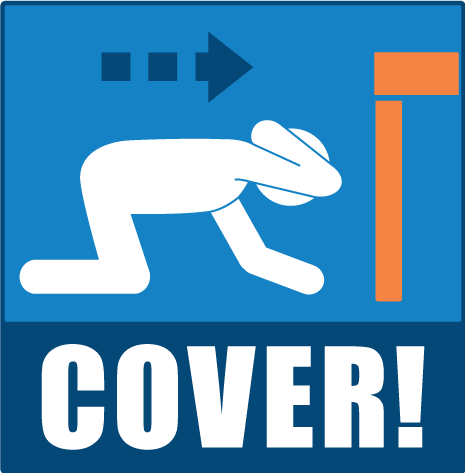 The ShakeOut is our opportunity to practice how to protect ourselves during earthquakes. This page explains what to do-- and what not to do. Your past experience in earthquakes may give you a false sense of safety; you didn't do anything, or you ran outside, yet you survived with no injuries. Or perhaps you got under your desk and others thought you overreacted. However, you likely have never experienced the kind of strong earthquake shaking that is possible in much larger earthquakes: sudden and intense back and forth motions of several feet per second will cause the floor or the ground to jerk sideways out from under you, and every unsecured object around you could topple, fall, or become airborne, potentially causing serious injury. This is why you must learn to immediately protect yourself after the first jolt... don't wait to see if the earthquake shaking will be strong! Why Drop, Cover, and Hold On? 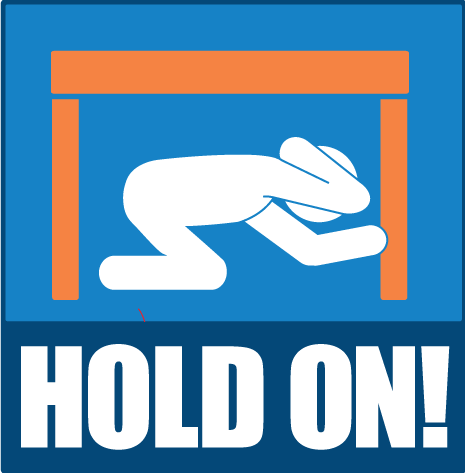 Our special report explains why official rescue teams, emergency preparedness experts, and others recommend "Drop, Cover, and Hold On" as the best way, in most situations, to protect yourself during earthquake shaking. Wherever you are, protect yourself! It is important to think about what you will do to protect yourself wherever you are. What if you are driving, in a theater, in bed, at the beach, etc.? Step 5 of the Seven Steps to Earthquake Safety describes what to do in various situations, no matter where you are when you feel earthquake shaking. Earthquake Safety Video Series: Simple videos demonstrating what to do to protect yourself in various situations (near a table, no table nearby, in a theater/auditorium, at the shore, while driving, and more to come). The main point is to not try to move but to immediately protect yourself as best as possible where you are. Earthquakes occur without any warning and may be so violent that you cannot run or crawl; you therefore will most likely be knocked to the ground where you happen to be. You will never know if the initial jolt will turn out to be start of the big one. You should Drop, Cover, and Hold On immediately! In addition, studies of injuries and deaths caused by earthquakes in the U.S. over the last several decades indicate that you are much more likely to be injured by falling or flying objects (TVs, lamps, glass, bookcases, etc.) than to die in a collapsed building. Drop, Cover, and Hold On offers the best overall level of protection in most situations. As with anything, practice makes perfect. To be ready to protect yourself immediately when the ground begins to shake, practice Drop, Cover, and Hold On as children do in school at least once each year. DO NOT get in a doorway! An early earthquake photo is a collapsed adobe home with the door frame as the only standing part. From this came our belief that a doorway is the safest place to be during an earthquake. In modern houses and buildings, doorways are no safer, and they do not protect you from flying or falling objects. Get under a table instead! DO NOT run outside! Trying to run in an earthquake is dangerous, as the ground is moving and you can easily fall or be injured by debris or glass. Running outside is especially dangerous, as glass, bricks, or other building components may be falling. You are much safer to stay inside and get under a table. DO NOT believe the so-called "triangle of life"! In recent years, an e-mail has circulated which has recommends potentially life threatening actions , and the source has been discredited by leading experts. Read our special report to learn more.